I’ve been writing here consistently for almost 4 years, 3 times a week. My purpose was to help myself through choosing Philippians 4:8 (which really works to keep your mind peaceful), to help others (there is hope and God writes the final chapter of our lives), and to develop a platform in pursuing a career in writing. Those things are still important to me. I have been busy with other responsibilities over the last couple of months I have not taken the time to write here. I will pick up writing consistently again at some point. But for now, it will be sporadic. If you read here, please know my priority is to be a real-life example of God sustaining me through the loss of my son and how that continues in every area of my life, even if I don’t post the personal particulars. That said, my real reason for writing today is to write about how I seem to be navigating through turning 60. It’s just a number but there are some real changes in thinking when a new decade rolls around. Life seems to bring about those changes, not because one implements them. My faith is my bedrock. It is grounded in truth and I know this to be true. Just like measurements are used for a successful result, the truth found in the Bible is a measurement for a successful result – even if that means you make it through something difficult or tragic. Since losing Christopher, there is a filter on my life. I see through a different lens. It is not unfocused. It is not cloudy. It is not dirty. If this sounds familiar, some will elude to the fact that you are not the same, therefore you are not seeing things correctly. Not sure if it’s you they are really concerned about as much as it is their issue. Life after losing a child is no different than having an injury resulting in life long, chronic pain. You manage. You live differently. But only God can give you peace. Hearts and minds. How wonderful. Because a confused mind and a broken heart need peace. It’s not like you will never have bad moments or days. But the peace will always kick in. We can go a life time thinking and doing things a certain way. It’s our normal. But then we discover it is okay to stop doing something we’ve always done. Like “put the face on” in order to make everyone else feel better. It’s a daughter thing. It’s a wife thing. It’s a mom thing. And depending on your particular situation and what is available to you, for the very first time in your life, you may have to think of yourself first. And it might mean STOP. As I have gotten older, I’ve seen the limitations at times, causing me to re-think my normal response. I used to be johnny-on-the-spot. No pondering. Just action. I can’t do that so much anymore. Let’s just say I think it through first. Since losing Chris, my emotional capacity is limited. Just like a person’s physical range of motion may be limited. Thing is, when you lose a child (I am certain it’s true of other losses, but it is readily acknowledged the loss of a child is the worst), people do not see the limitations. I am now at a place in life where I have at least accepted the fact that I can no longer keep pleasing others in exchange for my own well being. If they don’t get it or if they won’t get it – then so be it. If you’ve lost a child, maybe this resonates with you. Because mothers, in particular, already put everyone else first. And we continue to want to make sure everyone else is okay without at least identifying the times when we are not. Often, we seek out the validation of others in order to allow ourselves to be who we are. Often, people will not understand. How can they? Don’t spiral down into hopelessness. God says, I will never leave you or forsake you. You don’t really know this until you are alone. I am on my way for the very first time in my life, being confident in who I am despite what others think I should be. 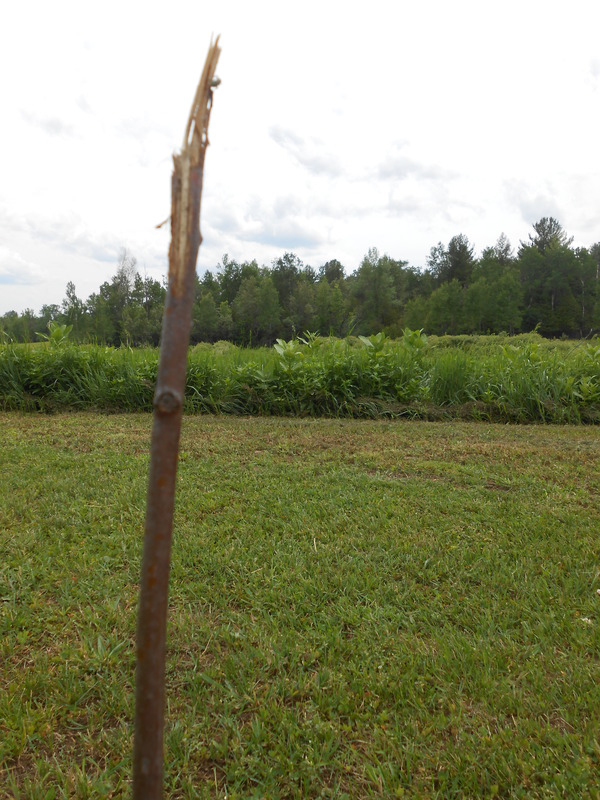 I carefully removed the oak tree sapling growing near the foundation of a house. I planted it, watered it, and protected it for 2 years. Recently, while I was mowing the grass, I got too close. The wire cage I surrounded it with got caught. It ripped the top off. The life of the fresh, green leaves just beginning to unfold was cut short. I thought about pulling it up and tossing it. Stuff happens. Move on. At the same time, I thought, wait. Don’t give up just yet. A couple of days later I noticed small sprouts of leaves at the bottom. But in a short time, they shriveled up. 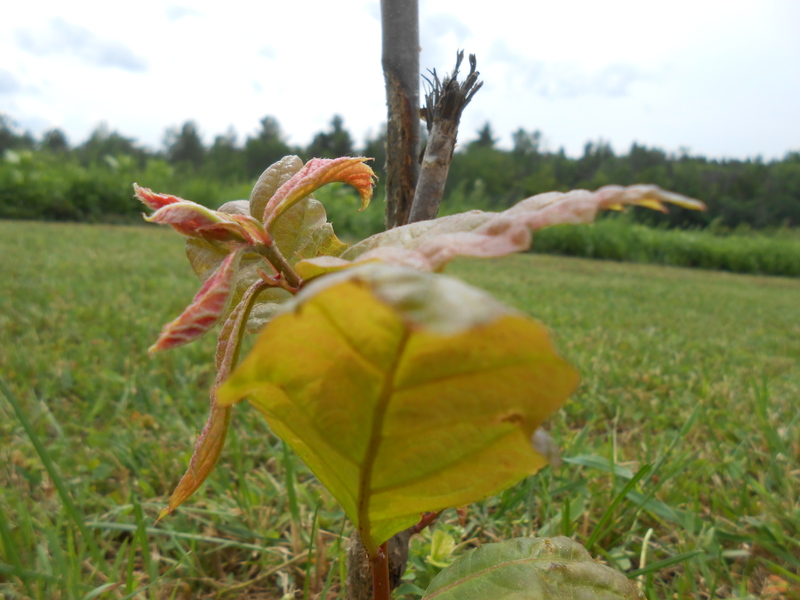 I had forgotten about my little oak tree until the next mowing a week later. I was prepared to toss if I had to. This is acceptance when things go wrong. See the broken trunk? This tree will have a scar. But it will continue to grow strong. This entry was posted on June 29, 2015, in Uncategorized and tagged losing a child, scars, suddenness. Like a wave, the crest of heightened emotion will fall to find a path as it crashes upon the shore of a new day … a new week … a new year. Life will demand and routine will resume. The fathers and mothers of the Sandy Hook school shootings will feel helpless. They will tread water as raw grief pierces deeper and the numbness wears off. Everyone leaves and the temporary buoyancy of strength leaves, too. You cannot leave them. Not yet. There is a gaping wound in their heart. And life is pulsating out of it with every breath. Place your hand of quiet presence upon their heart until it beats on its own. The silence is deafening. Weeping openly was allowed. Life must go on we tell them. But life is on hold for them. Let them. Please let them. There are no words to comfort. All they want is their child back. Time. They need lots of time. Time to learn how to live again. Some will not want to live again. This entry was posted on January 15, 2014, in Uncategorized and tagged grief, losing a child, time. I’m not going to tell you this year will be better. But I can tell you that you are not alone as you face a new year. The Lord is my helper; I will not be afraid. When we’re faced with trouble, sadness, disappointment – no matter what it is – we can be sure God is with us. I know this to be positively true. The darkest time in my life was when I lost my son at age 24. They say losing a child is the worst thing. You have to believe in someone bigger than yourself. And when you do, there are surprises along the way – like love notes just for you – from your Heavenly Father. This entry was posted on January 2, 2013, in Uncategorized and tagged afraid, alone, disappointment, God, Heavenly Father, Lord is my helper, losing a child, sadness, trouble.